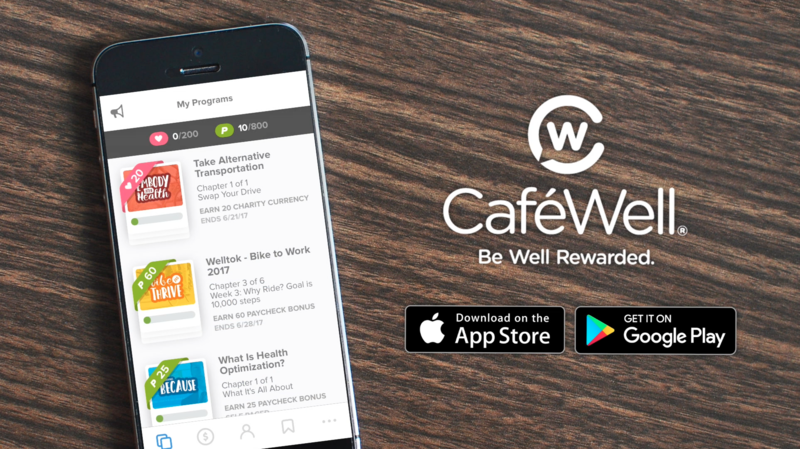 We are excited to introduce the new CaféWell mobile app based on extensive user research, expert consumer design experience and internal testing by Welltok employees (yep, we walk the walk, too!). The new CaféWell mobile app for iOS and Android is designed to keep people connected with the activities that drive positive outcomes for their health. What should I be doing to be my healthiest? While it may seem that these questions are easy to answer, they aren’t. Several different variables play a role in a consumer’s health and each personal question deserves a personalized answer. One of the ways that Welltok is spearheading personalization in healthcare is through technology that is within consumers' reach. Here’s how the new app addresses consumer questions and goals: In the world of digital health, it’s now possible to provide each individual's health journey with knowledgeable experts, behavior science, user experience design and solution engineering. Welltok brings all of these components together to continuously enhance each health journey. Whether we voice it or not, the question of "how we are doing" can be the source of personal motivation, conviction, or perhaps more often, stress and worry. This question can pop up at the most inopportune times, making follow-through or investigation difficult. CaféWell mobile provides on-the-move access to personal assessments, content and programs that can give consumers insight into your health status and relief through education, coaching content, and personal recommendations. While using CaféWell, biometric data, activity, and continued assessments provide the insights that can lead to behavior change and optimal health. CaféWell mobile helps to filter through the sea of options and find the best matches for individuals based on their goals, eligibility and health data. Whether they're looking to improve their health or are trying to manage a chronic condition, the new CaféWell mobile app will start consumers off with a few top recommendations and give them more along the way to meet their individual needs. People are empowered when they can see the results and trends in their performance. This gives them confidence that they are "doing it right" and are getting credit for doing so. Julian B. Rotter and other modern psychologists refer to the psychological concept as "Locus of Control"—the sense of personal control vs being controlled by external forces. Welltok made visualizing progress a central point in the CaféWell experience. CaféWell mobile is designed in such a way that users are able to focus on one step at a time, instead of having to manage and prioritize activities. Programs and progress are displayed in a simple and approachable way. For those who already use CaféWell, they will find all of their programs and progress right where they left off—synchronized between the mobile and web experience. One of the most exciting features of this new app is that users are able to track their activity and earn rewards by simply carrying the app in their pocket. Once they have connected to Apple Health or another popular activity tracker, CaféWell mobile updates their step programs so that they can focus on being active instead of pressing buttons. CaféWell mobile keeps consumer health front and center and most importantly, provides a one-of-a-kind, personalized experience. See for yourself.